It’s summer and the temps are hot right now, right? Who wants to turn on your oven and bake potatoes? Not me! This is a VERY handy way to “bake” your potatoes. You can fit quite a few in your slow cooker and you don’t have to worry about heating up the house on a hot summer day. I think this method is quite brilliant. . . . especially because the potatoes come out soft. Just as if they’ve been baked! Not to mention that the slow cooker will keep your potatoes warm for quite some time if you’re serving a crowd. The only trick here is to remember to put the potatoes in the slow cooker 8ish hours before you’re ready to eat/serve them. Pretty darn easy if you ask me. Wash your potatoes well and let them dry. Then wrap each potato in a piece of foil (no need for pricking them). 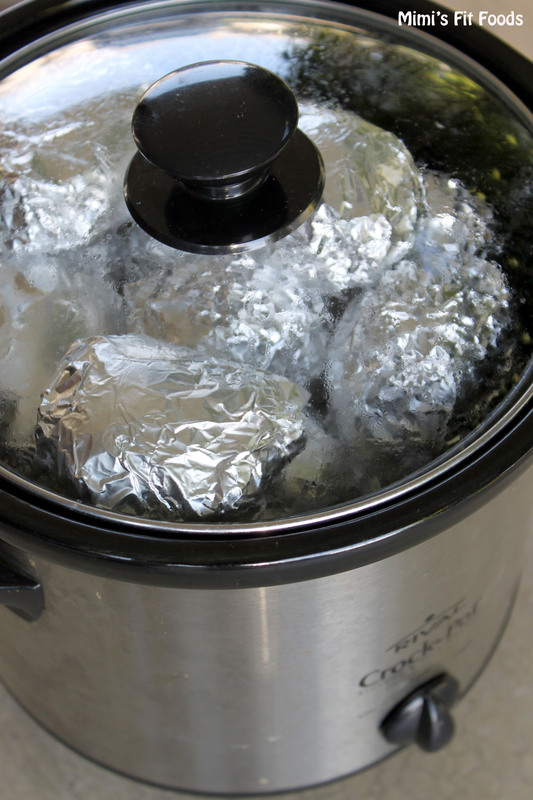 Place the foil wrapped potatoes in your slow cooker. I put 10 medium sized potatoes in my 4 quart crock pot.